There’s always the potential for me to have a disaster in the Hardmoors 60. My record with this race leading into it was as follows: run 4, finished 2, DNF 2, so I had this year’s race down as the decider. 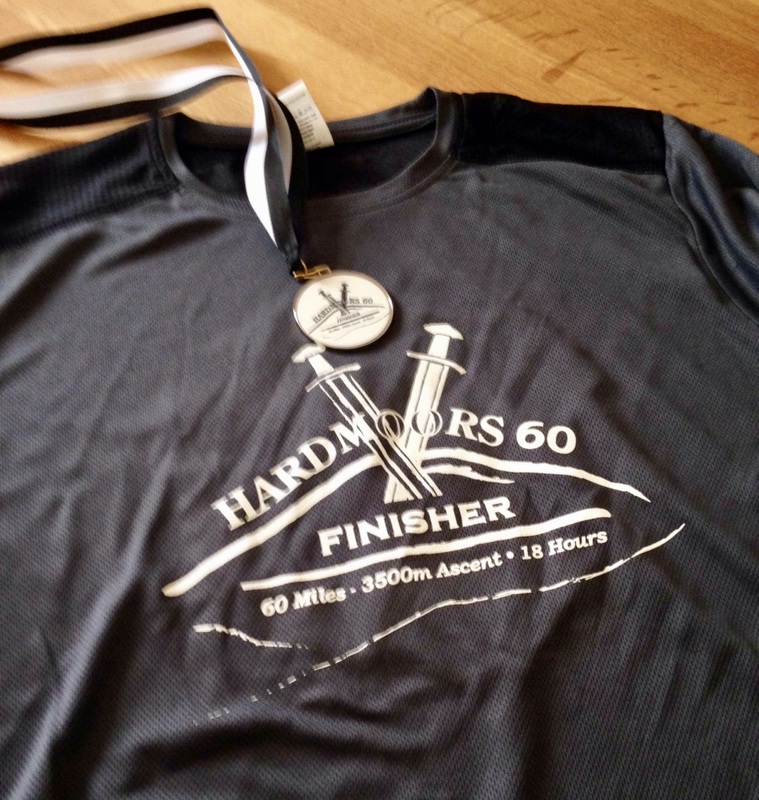 I was not going to be beaten this time – Hardmoors 60 is a Beauty and the Beast race. 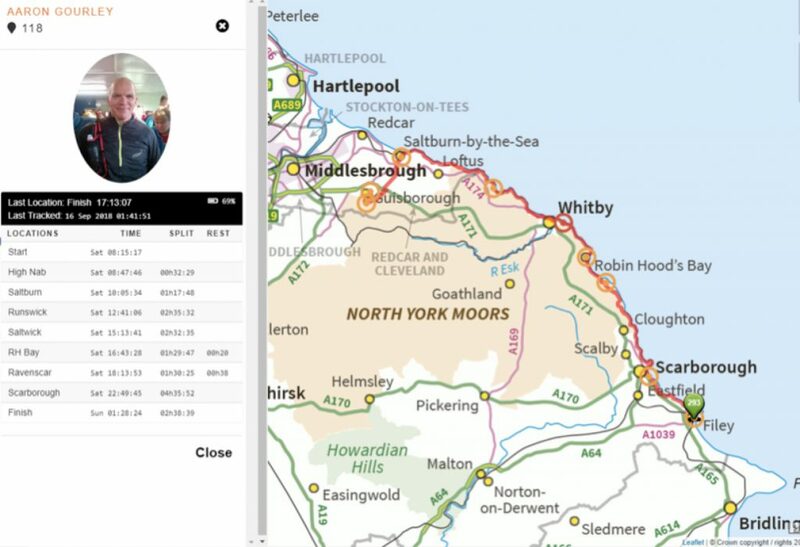 The course is stunning beginning in Guisborough following the Cleveland Way out to and down the North Yorkshire coast through places like Saltburn, Staithes, Runswick Bay, Whitby, Robin Hoods Bay and Scarborough before finishing in Filey. There are long sections of coastal running which weave in out of inlets and up and down steep ravines. There are sections across beaches and climbs to the highest east-facing cliffs in England along paths that run precariously close to the dramatic and dangerously crumbling cliffs.The towns and villages provide an assault on the senses after the solitude of the open countryside – Whitby being particularly tough to negotiate at midday on a Saturday. I have a love-hate relationship with this race for the reasons already stated. Each running, successful or not I’ve said never again, only to return. 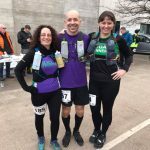 This year I had my sights set on completing the Hardmoors Triple Ring – finishing three of the organisation’s ultra races in a calendar year. For this I’d already completed the 55 in March, the 110 in May, so I had to finish this one to complete the challenge. However, my running this year has taken a dip – in fact, it’s been a tale of personal worsts. 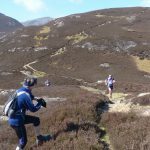 From poor displays in cross-country early in the year, to fell races that have been DNF’d or were hugely slower than in previous years. Then there was the Hardmoors 110 which became a battle with my body to complete. It’s like I’m stuck at the foot a steep-sided valley with long distance running on one side and speed on the other, with the bridge to the gap above me, whilst I walk underneath it. My training throughout the year has been particularly good, or at least consistent, but on reflection not particularly specific to any specific event. However, life has gotten in the way too often so maybe that has played a part, but that’s not to say I haven’t done enough. Going into the Hardmoors 60 I’d been able to get out on some fairly lengthy runs in the Lakes – not particularly long distances but long hours and lots of elevation being the main focus. The week before the race I’d ran the Great North Run and recorded a course personal worst by 11 minutes. 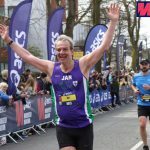 Not particularly anything to do with my running but more from where I started the race and the inability to run the pace I’d have liked due to the number of people – in all I wrote that race off as a bad experience on the roads. So at 2:45 am, on Saturday 15th Sept I woke, got quickly ready and headed off down the road to Filey for the 5:45 am bus back to Guisborough for registration which was efficient as ever. There was a lively buzz in the room and after a short delay, we were moved outside ready for the start of the race. At 8:15 am, we were off. 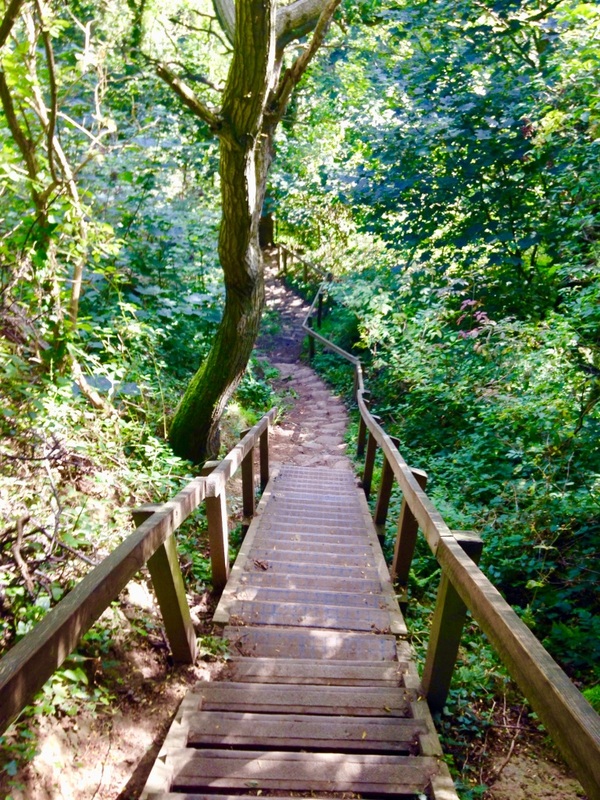 My mind was set to start conservatively, run my own race and not worry about being passed as the route headed west into Guisborough Woods before swinging south up the very steep Tees Link path to High Cliff Nab to join the Cleveland Way. From here we headed east to the coast at Saltburn. I’d started near the front so I was aware that I’d be passed by a large number of people, but I had to stay focussed to maintain my own pace. The first few miles were about finding a rhythm and my natural place in the field. It’s around 9 miles to the first checkpoint and I was feeling in control and enjoying the morning. The temperature and conditions were almost perfect for running. At Saltburn, I made swift the chance to refill bottles and grab some treats before setting off for the climb out onto the coast. From here the route meanders south along pleasantly rolling cliffs. I was enjoying myself, still taking it steady and was feeling good as I made my way to the next major checkpoint at Runswick Bay, 21 miles-in where I grabbed my first drop bag. Again I stopped only for as long as required to pack the extras from my drop bag and refill bottles before making off down the road to the beach, crossing to the ravine that leads sharply back onto the cliff tops. Onwards I pressed eating and drinking well. 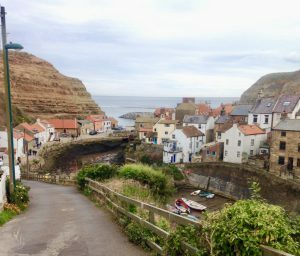 Into Staithes I rolled and back out towards Sandsend, happily chatting to other runners and Cleveland Way walkers, keen to know what we were doing. At Sandsend the route drops to sea level and joins the road route to Whitby which is a steady climb but nothing major to worry about. But then my toils began. Near the Golf club I came a cropper – once more nausea got the better of me. 29 miles and in turmoil – the battle between my body and mind began. I made my way to and through Whitby at a snail’s pace but with determination to reach Saltwick Bay checkpoint. 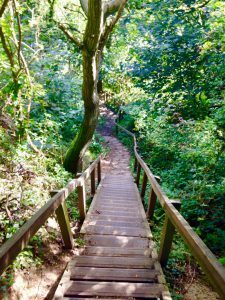 Once there, I didn’t stop, and pressed on – my mind was now focussed only on getting to Ravenscar. If I could get there I could rest and recoup. But first I had to negotiate the 5 miles to Robin Hoods Bay then the 4 miles to Ravenscar via Boggle Hole – possibly the toughest section of the whole race in my opinion. It took an age to reach Robin Hoods Bay. The checkpoint at the top of the village provided welcome relief and another opportunity to refill and refuel. I stayed for a few moments longer than I should have and set off hoping to make it to Ravenscar in good time, but my body had other ideas. Not my whole body though, just my stomach. In fairness, my legs felt fine. I was clearly benefitting from the long hours out on the fells. Although I was in a state, I felt strong climbing and descending, my only problem was pace. Anything beyond a slow walk made me feel ill. It wasn’t pleasant. Eventually, I made it to Ravenscar, 41 miles in and the only indoor checkpoint on the race. Like Kildale is on the 55, Ravenscar is a little place of sanctuary. I slumped into a chair, and after trying some of the soup on offer and a cup of tea, I closed my eyes and fell asleep. I woke with a jolt, I looked at my watch and it was approaching 7 pm, I’d been in the hall nearly 50 minutes so I grabbed my things together and made my way back out. I felt much better but still conscious of the nausea that had plagued me over the last few hours. I’d made a decision. I wasn’t being beaten by this race, my only option was to keep going and walk it in. It wasn’t how I envisaged the race would turn out but I knew I had plenty of time to do it. It was now dark as I made my way through the diversion at Hayburn Wyke and back onto the cliff tops towards Scarborough. This section is unforgiving – Scarborough Castle sitting prominently ahead in the distance never seems to get any closer. 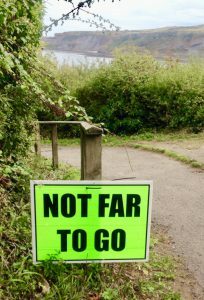 It’s a 10 mile stretch from Ravenscar to the next checkpoint at Holbeck car park at the southern end of Scarborough and it was 10:49 pm when I finally arrived at the checkpoint. I knew I had the race complete now, just 10 miles left to go but was pressed for time. However, I knew I could make it before the final 2 am cut-off. I felt strong despite my earlier woes but knew I couldn’t run or risk being waylaid by sickness. I was able to maintain a decent paced walk as the route dropped and rose along the coast at Cayton Bay before hitting the final stretch into Filey. Headtorch beams ahead made for targets to catch and those behind to beat. There was a bit of yo-yoing with others over the final stretch until eventually, I reached the official end of the Cleveland Way out on the Brigg. The route then takes a final turn along tops and down onto the beachfront leading into the Town Centre where I managed to catch a group of four and pass them before breaking into a little trot so that I could open up a gap between them and me. The final push up the hill to the finish was done with a smile – I’d completed the race. I got my t-shirt and medal. It was a personal worst by a (Hardmoors) mile. It took me 17hrs13mins – a good 3 hours slower than my best time but in keeping with my long line of other terrible results this year. But I’ve come to accept that there’s been toil, things haven’t gone my way, but each run I’ve done this year I’ve tried not to let it bother me. I’m out for the adventure and the satisfaction of running and being free. I know things have been better and I’ve run quicker but I think I’ve enjoyed this year more despite the toil. However, I know there are things to fix; my nausea in races is a major problem that I will now work to solve and overcome. 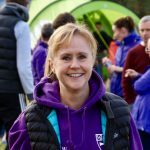 I have my plans for next year in place and the hard work starts now but I will try to ensure I continue, above all else, to enjoy running and never let things get me down if they don’t go to plan but to be positive in the knowledge that I can still take part in such an open and inclusive sport like running.